As much as some people like to chalk me up to being a glamorous, attracted-to-expensive-products green beauty blogger, you dear readers know me better than that. You know that I like to review the best of the best, be it expensive or frugally priced products, and you also know that I have no shame for getting a bit TMI on here for how I treat everyday skin issues and nuisances. 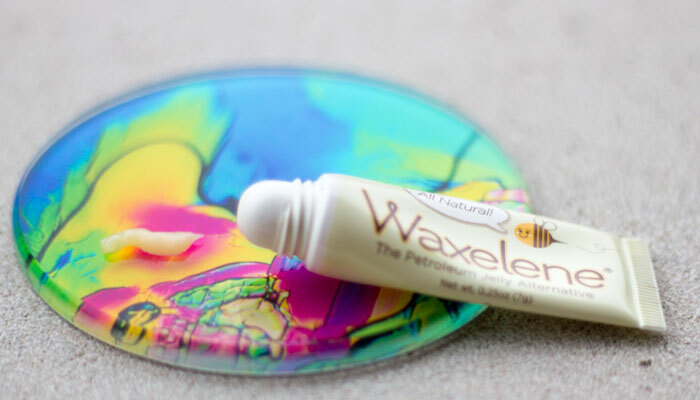 Today’s post gets into the un-glam side of being a human, and details just how I love to use Waxelene, probably the most un-exciting product to those of you used to exotic ingredients and fancy packaging. Time to get real, y’all! Dubbed “The Petroleum Jelly Alternative,” Waxelene is a lovely all-purpose, American-made moisturizer made of organic soy oil, beeswax, organic rosemary oil and natural vitamin E from soybeans. That’s it. No fancy carrier oils or nasty petroleum-derived ingredients. Just four simple yet oh-so-effective ingredients that work hard to keep your lips and skin lubricated and protected from the elements. Now clearly, I have the “Lip Tube” on showcase today, but besides using it to coat my lips during brutal, cold windy days, my other absolutely favorite way to use Waxelene’s Lip Tube is to keep my dry, itchy, irritated nose in check as the weather fluctuates and drives my skin into overdrive. So, basically, I’m saying that I like to put Waxelene onto my pinky or, if I’m feeling fancy, onto a cotton swab, and stick it in my nose. Hello, relief to my dry, flaky, about-to-bleed nose! Hello, grossed-out looks from strangers and friends! The Waxelene Lip Tube distributes the perfectly sized strip of product to fit inside my nose and keep it moist and protected. I don’t know about you, but I’m prone to nosebleeds and extreme irritation during crazy weather patterns, dry air and drops in pressure. Sorry to get so detailed here, but I get scabs in my nose sometimes from these weather conditions, and it’s awful! Waxelene has been a savior to my nostrils, and is the only thing that nurses them back to health in a timely manner. 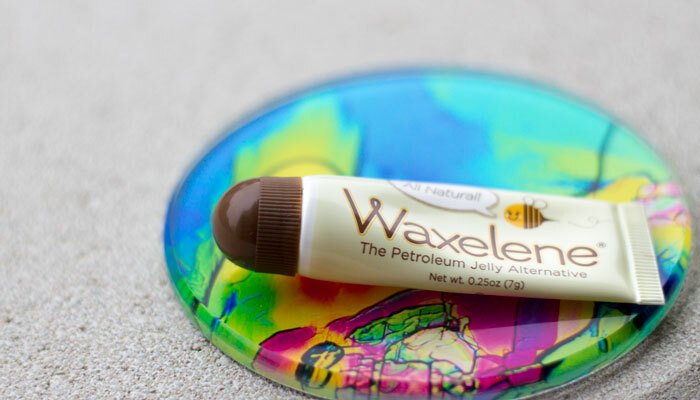 I also have a backup stash of Waxelene Flip Tube, which is a larger tube designed more for use as a hand cream or larger-surface-area moisturizer, but this isn’t my favorite use for this wonder jelly. As a hand cream, it’s just blah to me — no real scent and a little too greasy — but as a lip balm and nose skin treatment? Sold! I’ll keep my flip tube in reserve for things like knee scrapes and body scab treatments, but it’s the Lip Tube that’s truly versatile and portable to me. While I love scented lip balms and enjoy interesting flavor and scent combinations, sometimes it’s just nice to have a very simple, classic lip balm that delivers heavy-duty hydration and protection without any fuss. It’s an even bigger bonus to have a product that doubles as a spot treatment for pesky, unglamorous winter skin issues. That, to me, is what makes Waxelene Lip Tube a winner and a repurchase. Have you tried Waxelene? What do you use it for? What sizes do you prefer? Tell me in the comments section!